Most of us will remember suffering from warts at some point during our lives. These raised lumps can appear on their own or in clusters and are generally found on the hands or feet (They are called verrucas when found on the feet but it is still the same virus). They are caused by an infection of the human papilloma virus which causes an excess of keratin to build up in the top layer of skin. It's this that produces the raised, rough texture of skin associated with warts. Warts are more common in children and adolescents in part due to their weaker immune systems; however, this is also thought to be due to the contagious nature of warts when in direct skin to skin contact and the fact that it can be also caught through indirect contact in swimming pools or sports changing rooms. Conventional treatments for warts often involve chemical acids or freezing of the wart using liquid nitrogen. Both of which can be painful, with limited success and sometimes scarring. Warts and verrucas will usually disappear on their own, taking up to a few years to disappear but you might decide to treat your wart if it is painful, or in an area that is causing discomfort or embarrassment. As is often the case, there are a number of natural remedies that are both pain free and leave no visible scars. One of the most powerful of these is colloidal silver. Colloidal Silver has been used effectively to treat bacterial and viral infections since the early 20th century although its use fell largely out of favour around 1940, when antibiotics became available. Over the last 20 years the health benefits of this miraculous elixir have come back into the spotlight. With new technology, colloidal silver can now be made with much smaller particles of silver, not only helping to increase its shelf life, but also dramatically increasing its effectiveness at fighting pathogens within the body. 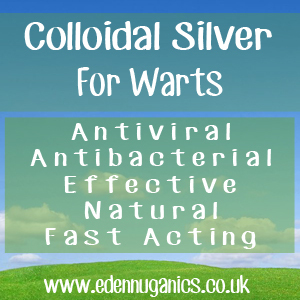 Colloidal silver, over time, will break down the structure of the wart allowing the silver particles to reach the root and destroy the underlying virus. This whole process takes around 2 weeks and there a couple of additional things you will need for it to be effective. The first thing to do is to collect all the items required. A pack of cotton pads, medical tape or large plasters and some high quality colloidal silver. Apply colloidal silver to a cotton pad, this may need to be cut or rolled to size as it only needs to cover the wart and not the surrounding skin. Next, using the medical tape, secure the cotton pad in place over the wart. Do this daily. During the next week or two, the wart will first blacken in colour and start to shrink in size before finally coming loose of its own accord. Other Natural Remedies for Warts? Apple cider vinegar - ACV is another extremely popular home remedy for the removal of warts, this rich fermented liquid is packed full of natural acids and enzymes that give the liquid its myriad of antibacterial and antiviral properties. Apple cider vinegar should be used in much the same way as colloidal silver, however the skin can become sore surrounding the wart due to the naturally occurring acids. If this occurs, discontinue use and try another method described here. Vitamin C - Vitamin C is another remedy that has been used in the treatment of warts for centuries, whether in the form of citrus juice or now more commonly ascorbic acid crystals that help to break down the wart and destroy the virus at the root. Manuka honey - Organic manuka honey, harvested in New Zealand, is one of the most powerful and effective remedies in the treatment of warts and verrucas. This potent type of honey contains antibacterial/antiviral properties and is able to withstand temperature fluctuation without losing its benefits making it far more stable than other types of honey.